It's beautiful, but it can be dangerous. 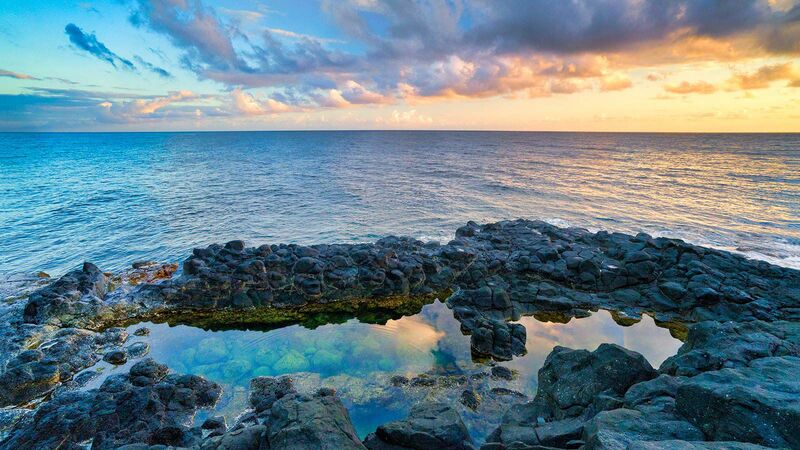 You can bathe like a queen in this tide pool, if you’re brave enough to get there. 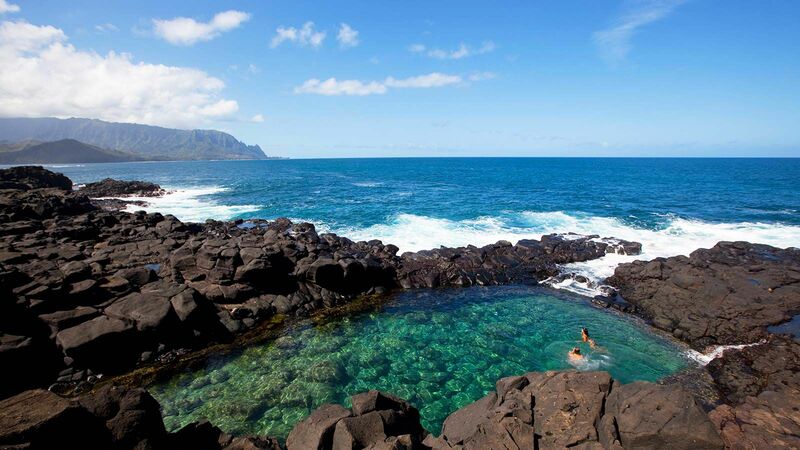 The Queen’s Bath, located in Princeville, on the north shore of Kauai, Hawaii, is a gorgeous and unique pool that’s separated from the ocean by lava rock. Water spills over the rocks to refresh the pool with water, and even some sea creatures live there. The pool was named the Queen’s Bath because it was, theoretically, once used as a royal bathing place. In the summer, the tide pool is a beautiful and romantic place to visit. During the warmer months, the waters are generally calmer and waves make it a great swimming spot. Visitors are encouraged to check the daily surf report — and are warned to be extra cautious to avoid the pool on days when waves reach above four feet. The winter, however, is a slightly different story. The season is marked with unpredictable tides, which are pretty hazardous even for experienced surfers and swimmers, let alone tourists who don’t know much about the ocean. While the lava shelf that protects the pool from the ocean tides is around 10 to 15 feet high in most areas, many waves in the winter can reach at least 12 to 15 feet, leaving very little protection. According to HawaiiGaga, there have been seven drownings at the pool between 1970 and 2012. Other visitors have been injured by unexpected waves and slippery mud trails leading to the pool. In order to deter tourists from trying to swim in dangerous conditions, locals have put up warning signs, including one that claims 28 people have died there. 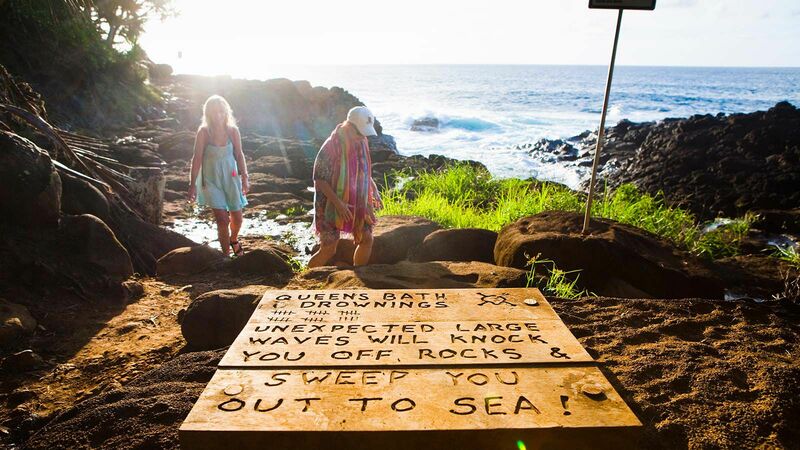 Despite how treacherous the Queen’s Bath seems to be, it scores 4.5 stars on TripAdvisor and is the second most popular thing to do in Princeville. Those who have swam in the pool have raved about its beautiful, crystal clear waters and the thrilling crashes of waves against the rocks. Many reviews also warn tourists to be extra careful, of course, and to wear good shoes for the 10-minute hike that leads to the pool. If you are looking for a thrill and you’re an excellent swimmer, a summer getaway to the Queen’s Bath can be a relaxing trip, plus it will give you a once-in-a-lifetime view. Princeville is also peppered with several luxurious hotels and resorts, including the Hanalei Bay Resort, the St. Regis, and the Castle at Princeville. Sometimes a little risk makes for an incredible trip — as long as you come prepared.